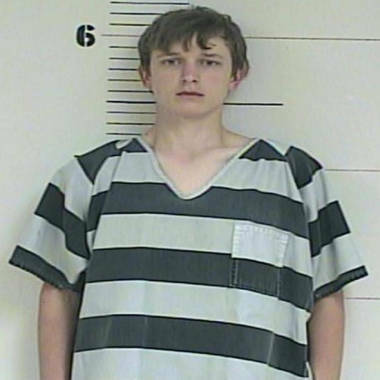 A Parker County, Texas, teen has been arrested on suspicion of double murder after he called 911 and said he shot and killed his mother and sister. According to police, 17-year-old Jake Evans called 911 at about 12:30 a.m. Thursday and said he'd used a .22 revolver to shoot and kill both his 48-year-old mother, Jamie Evans, and his 15-year-old sister, Mallory. "It just kind of happened," Evans told the 911 operator in an eerily calm voice. "I've been kind of, uh, planning on killing for a while now." When asked if he meant the two of them or just anybody, Evans responded: "Pretty much anybody." A short time later, Parker County sheriff's deputies arrived at the Evans' family home in Annetta, a town of about 1,700 west of Fort Worth, and took him into custody without incident. "I guess this is really selfish to say but, to me, I felt like they were just suffocating me in a way. I don't know," Evans said during the 911 call. "Obviously, I am pretty, I guess, evil," he said. Evans is charged with capital murder. A judge denied him bond. "Just to let you know, I hate the feeling of killing someone, you know," Evans said in the 911 call. "I'm going to be messed up." The teen's father was out of town on business when the killings took place, police said. NBC 5 has been told that the father raced home from Washington, D.C.
Leslie Richardson, a family friend, described Evans as quiet and gentle. "Everybody knew him as just being the quiet kid ... but he was really sweet and gentle," she said. NBC 5 has learned that Evans' mother was a teacher and assistant principal in the Aledo Independent School District for 15 years before leaving in 2004. "I mean, she was kind of like a second mom," Richardson said. "They were just a really good family and, I mean, my whole family was close to them, so I wish I could just say that I love them." Friends described Mallory Evans as pretty and sweet. She and her brother previously had been students in the Aledo ISD but were home-schooled. The family has two other daughters who were not home at the time of the killings. One of the daughters was scheduled to come home from college this weekend for a visit. Parker County Sheriff Larry Fowler said authorities believe Evans acted alone and that there is no evidence implicating any additional suspects. The double homicide is being investigated by the Texas Rangers and Parker County Sheriff's Criminal Investigation Division. Aledo ISD is deeply saddened to learn of the death of a former employee and a former student. Jami Evans was a dedicated elementary teacher and assistant principal who worked in Aledo ISD for 15 years serving students at both Coder and Stuard Elementary from 1989 through 2004. Her dedication to her students and her love of learning was an inspiration to all who knew her. We also mourn the death of Mallory Evans, a former elementary and intermediate school student. Mallory attended Stuard Elementary and McAnally Intermediate School. She was a sweet child that will be missed by her friends and school family. The suspect in the shootings, Jacob Evans, is a former Aledo High School student who withdrew from school in January 2012 to be homeschooled. He attended Aledo schools from elementary school until his withdrawal in January. He played football in middle school and played on the golf team in high school. Our thoughts and prayers are with the Evans family in this difficult time. NBC 5's Ray Villeda and Ellen Goldberg contributed to this report.